Australian nurses and patients at the Auxiliary Hospital Unit in Antwerp during the first world war. Ex-service women are often involved in the Anzac Day March. Recep Tayyip Erdoğan has been a central figure in linking the Gallipoli campaign with Islamic conceptualisations of the Turkish nation. The win for the “yes” side in Turkey’s recent referendum on the powers of the president has fundamental implications for parliamentary democracy in the country, and for relations between Turkey and the west. For Australia, the referendum has an additional significance: by entrenching the power of Turkish President Recep Tayyip Erdoğan, it will influence the future of Australian commemoration activities at Gallipoli. The numbers of Australians, along with other westerners, visiting Turkey has recently declined dramatically. This is a consequence of ongoing political instability in the country following last year’s attempted coup d’état and a series of terror attacks. The Australian government also recently warned of potential attacks targeting the Gallipoli battlefields on Anzac Day. A significant decline in this pilgrimage activity will likely have a wider impact on the way Australia understands Gallipoli. This is particularly the case given the continued resonance of an Anzac narrative characterised by a historical empathy for Turkey’s perspective on the war. The Gallipoli campaign has, in recent years, become part of the culture wars in Turkey associated with the rise of political Islam. This has seen Gallipoli increasingly referred to in relation to an Islamic jihad, and as an invasion of crusaders into the house of Islam. Approximately 1 million Turks visit the battlefields each year. And an estimated 10% of the Turkish population have at some stage engaged in some kind of martyr tourism at Gallipoli. [The] crusades were not [finished] nine centuries ago in the past! Do not forget, [the] Gallipoli [campaign] was a crusade. 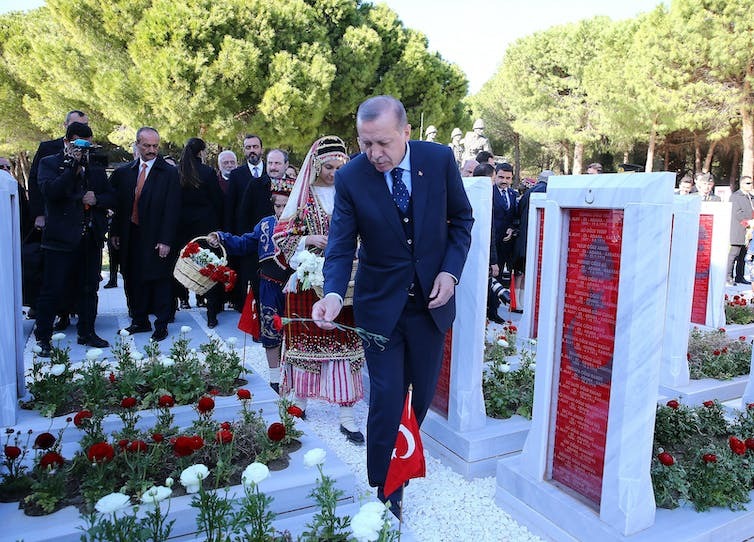 Following the failed coup, Erdoğan also evoked the memory of Gallipoli. Recreated scenes of the Ottoman victory in the land battles against Anzac soldiers played on large screens in Taksim Square as he addressed cheering pro-government crowds. The vision was taken from a controversial TV commercial originally produced for the centennial commemorations of the Gallipoli battle. Its use of various Islamic symbols was widely interpreted as breaking with traditional secular ways of remembering the campaign. Significant shifts in Turkish memory of Gallipoli are not unprecedented. Since the 1930s there has been a few turning points in how the campaign is understood. First, and most significant, was the victory of the Ottoman Imperial Army in being “Turkified”. Arab, Kurdish, Greek, Armenian and Jewish soldiers and officers were cleansed from the official narrative. This also involved de-emphasising Germany’s role as the Ottomans’ allies in the first world war. The official nationalist narrative has glorified the military leadership of Colonel Mustafa Kemal (later Atatürk) in the battles against British and Anzac forces. This has linked the collective memory of Gallipoli with the independence movement that led to the formation of the secularist Turkish nation-state in 1923. The historiography of Gallipoli is now potentially undergoing another major change. The classical Turkish view of Gallipoli may be being replaced by an Islamic-oriented narrative. Turkish pilgrims once were told the same historical tales by the guides that also took Australian and New Zealand visitors around the battlefields. But now, the vast majority of locals visit through bus tours that are arranged by Islamist municipal administrations for their residents, free of charge. In contrast to local guides embedded in the tourism industry, those who lead the bus tours are more likely to express an Islamic narrative of Gallipoli. This trend is apparent in an increasing popular march that re-enacts the mobilisation of the legendary 57th Regiment to defend the highlands from Anzac troops. This involves approximately 20,000 young boys and girls from scouts and other paramilitary organisations. And it is common for participants to wear t-shirts remembering their ancestors who fought at Gallipoli. It’s hard to know precisely what the consequences of these new commemorative rituals will be for the collective memory of Gallipoli. From fieldwork research on the Anzac pilgrimage, the motivations and meanings taken away from the battlefields are often different from that which politicians and social commentators have often assumed. All nations are shaped by their histories, their memories and their stories. When we retell a story, we actively choose which parts to retell. Our present day positions, our politics, our families and our environments all have considerable bearing on these choices. Such choices of representation also apply to nation-building narratives, which are then used for the political purposes of the day – such as John Howard’s use of the “Anzac myth” to support military interventions in Afghanistan and Iraq. We call this process of choice the “politics of memory”. Generally, it supports a resoundingly masculine dominant Australian folklore – encompassing bush mythology, a pioneering spirit, sportsmanship, larrikinism, and mateship. It’s populated by characters such as Ned Kelly, the “jolly swagman” of Waltzing Matilda or Crocodile Dundee. When “we” as a nation remember Anzac, we simultaneously forget significant parts of the story not commonly represented. Influencing this (selective) forgetting is an implicit whiteness. the visible and public side of power remains essentially Anglo-White. Our recent ethnographic and archival research shows that little investment has gone into thinking through what might happen to the Anzac identity in a more culturally diverse Australia. Our critical analysis of Anzac-related literature, news media and popular symbols revealed that cultural diversity and multiculturalism receive only tangential attention. This is not merely chance. Reports commissioned for the Department of Veteran Affairs preceding the centenary of Anzac identify “multiculturalism” as a risk and issue to consider in planning for the centenary, and as a “potential area of divisiveness”. Significant events, like Anzac Day, are opportunities to reiterate an approved narrative of war-centred nationalism – and vigorously disparage any form of critique that might arise. Examples of non-conformance to collective Anzac narratives are rare, but they do occur. A particularly visible debate arose out of the film The Water Diviner (2014), directed by and starring Russell Crowe. While focusing on Gallipoli, the film offers an account that foregrounds a Turkish perspective on the campaign. McIntyre’s dismissal shows that, in the midst of the well-supported and popular Anzac narrative, contested and not-so-salubrious parts of the story aren’t tolerated and get little public airtime. Indeed those who deviate from the narrative line are vilified. The Australian government ensures that the nation remembers Anzac each year by marking the event with a collective commemoration. As a settler society, collective remembrance is an important government function. But how, what, where and why we remember should be relevant to our geographically disparate and culturally diverse populace. For many years the hard lines drawn around Anzac memory excluded recognition of Indigenous involvement in WWI, even in official commemorations. Returned Indigenous soldiers encountered considerable discrimination. They were excluded from early attempts to commemorate military service and the war dead; forgotten in the war memorials; denied the right to participate in Anzac Day marches, and refused access to veterans’ benefits and entry into RSLs. Since the 1990s, a number of attempts to commemorate Indigenous war service have occurred, contributing to what historian Peter Cochrane calls a “new inclusiveness”. These early efforts tended to materialise on the margins: a plaque to Indigenous war service erected on public land behind the Australian War Memorial by a private citizen in 1993; a commemoration in Burleigh Head National Park inscribed in 1991; and an Australian War Memorial travelling exhibition, Too Dark for the Light Horse, that toured Australia in 1999 and 2000/1. More recent demands have more successfully permeated the politics of Anzac memory, resulting in Indigenous memorials in shared spaces. These include the Torrens Parade Ground memorial in Adelaide, completed in 2013 and commonly referred to as Australia’s first memorial to all Aboriginal and Torres Strait Islander servicemen and servicewomen. A memorial honouring Aboriginal and Torres Strait Islander service men and women at Torrens Parade Ground in Adelaide. Another is the sculpture Yininmadyemi – Thou didst let fall, created by Indigenous artist Tony Albert for the City of Sydney and installed in Hyde Park in 2015. Shifting political agendas have also facilitated greater inclusion of Turkey into dominant Anzac memories. Historical media research by Catherine Simpson details this movement from “foe” to “noble Turk”, culminating in a nationally celebrated, government-constructed, friendship. Similar questions can be raised about the inclusion of other national groups. We’ve seen a rising interest in researching, for example, German, Irish, Russian or Chinese “Anzacs” who were fighting on the Gallipoli peninsula. Soldiers of many nationalities have been present with Australian troops in numerous conflicts, including Gallipoli, Kokoda and Vietnam. What is Anzac’s future in multicultural Australia? Research has shown that Australians born here are more likely to prioritise Anzac as a key marker of national identity than other Australians. This finding is not surprising. Indeed, much cultural and political work is invested in positioning Anzac as tantamount to Australian identity. While the Anzac story was produced in colonial White Australia, Australia today is vastly different in demographic terms and is made up of people whose histories increasingly lie elsewhere. Australia has invested significantly in multicultural policy and committed to creating an inclusive nation. 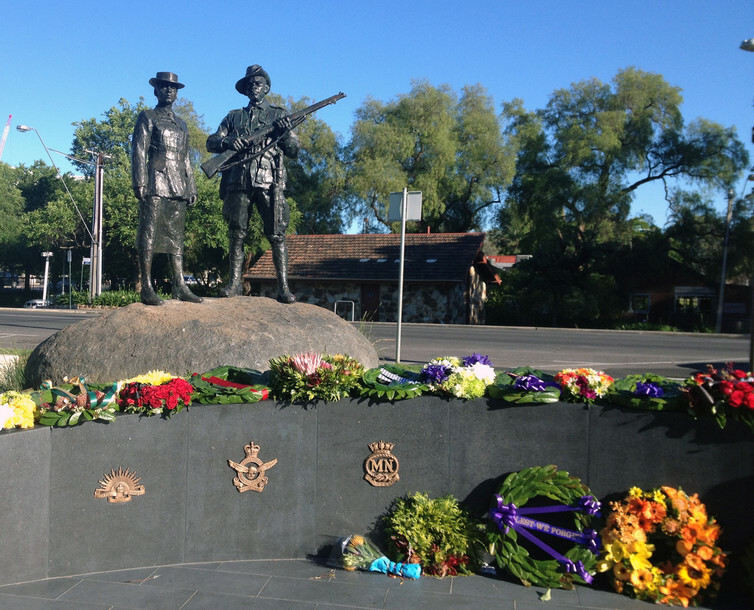 What happens when Australians do not, or cannot, identify with the Anzac narrative genealogically or nationally? What happens if we simply do not want to participate? Should Australians not born here be expected to “inherit” the Anzac narrative unequivocally, and exactly how would that happen? 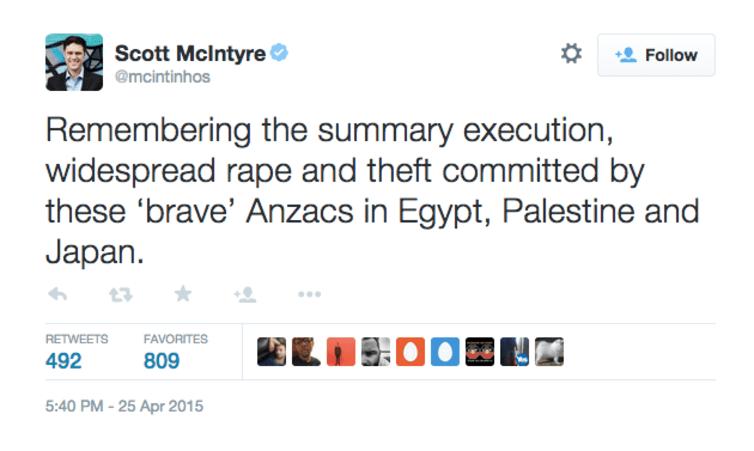 And does not identifying with Anzac really equate to being un-Australian? Like others who have also questioned Anzac’s centrality, we think that there is much to celebrate in Australia’s diversity. Despite discordance, we live in a nation that has a mandated political commitment to diversity. In the current global climate of fear of difference, isn’t that commitment – to being a country of people from diverse countries – worth commemorating?